My layout has truly been an evolution. It started out to be a representation of Casa Grande, AZ after I moved from Southern California in 2008. Casa Grande had all of the great parts of the old Southern Pacific in place. The single track mainline still had a Southern Pacific station, Southern Pacific signals, and a pair of gray and red GP40-2’s switching the locals. Unfortunately, all of the things that drew me into modeling the Arizona desert has been removed. The station burned, the old line side structures and signals were removed when the mainline was double tracked, and slowly my interest started to change…. Model Railroad Hobbyist E-Zine had a track planning contest to design and build a layout for $500. The $500 includes track, a power pack, motive power, cars, buildings and scenery. I went to Lowe’s and I bought three 1×4 furring strips, trimmed them down to size, used a pair of sides from a broken Ikea dresser for a surface. The benchwork is a pair of 14″x37″ boxes, the layout is now about 14×74, the benchwork cost me a whopping $13.00 including the hardware. With my GP35R that was purchased used for $55.00, and has $14.00 worth of detail parts and a $35.00 power pack, I have already blown through $117.00 of the budget. Five #6 Atlas code 80 switches and Caboose Hobby ground throws brings the total up an additional $77.00, add in another $22.00 in flex track, and $11.00 in 18 gauge wire (Wal-Mart sells 40 ft of 18ga wire in the auto section, only in red and black, for about $5.50) brings me up to $227.00, add in my bay window caboose, and I am up to $257.00. I have now used 51.4% of my total budget. Now, if we look at the rolling stock that I have picked up, we are adding in an additional $169.00, meaning that I have $74.00 to add structures, paint, scenery and ballast my track. My house walls are already a tan, and most of the layout is going to be dirt (free and free). While I have ballast and ground foam, I have not removed them from my budget YET. 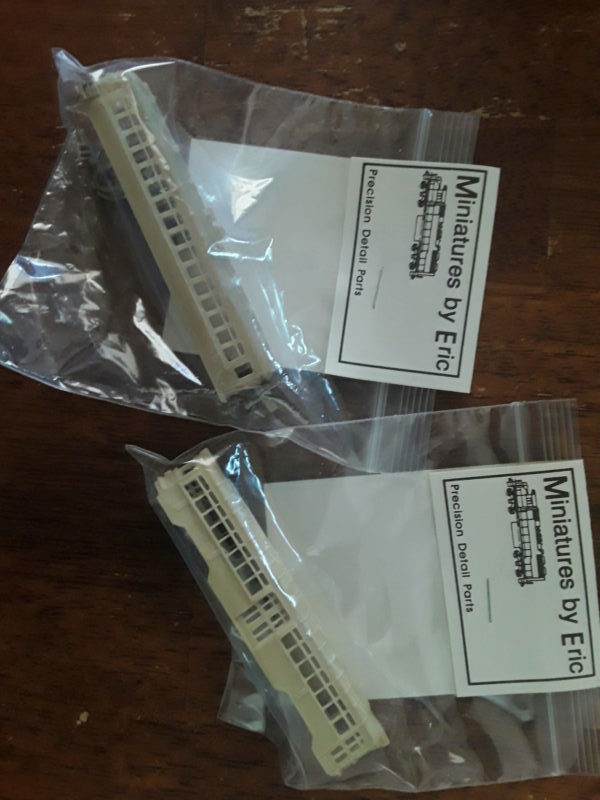 I also bought a Walthers ADM grain elevator for $30.00 on a Walthers special will bring me down to $37.00……will I be able to build a warehouse and a liquid feeds plant, convert a pair of OLD Atlas tank cars to Micro Trains couplers for under $37.00? The answer was no. I gave up on the $500 budget and got a NCE Powercab. 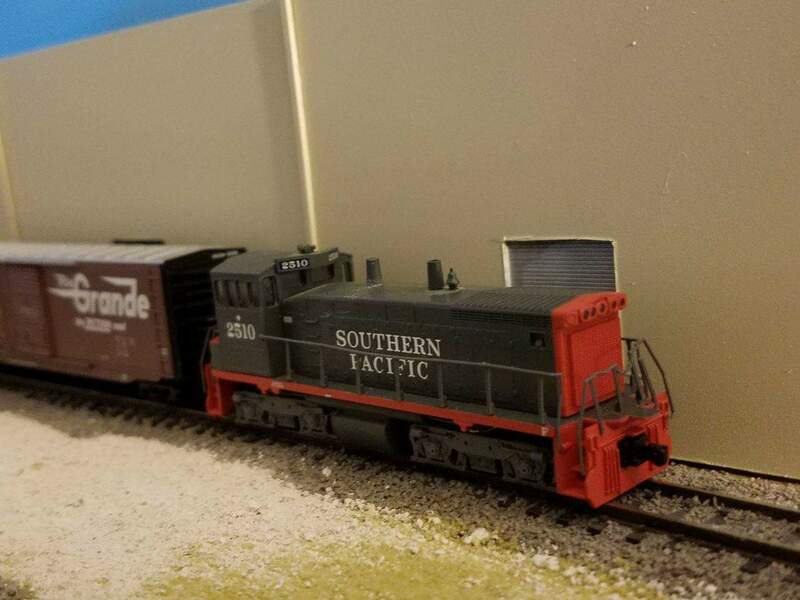 I have installed a decoder into the GP35R. To this date, I only have one DCC equipped loco. I then started to scratch build structures. Below is a picture of my first successful scratch build. My friend Joe D’Amato has been a great source of inspiration and tips. He saw something inside me that has always been there that I was suppressing, my love of the old Pacific Electric in Southern California. 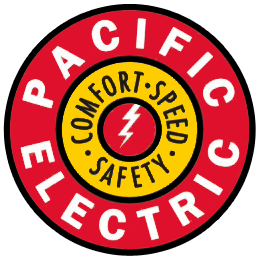 The Pacific Electric sold off it’s passenger service in 1953, and merged into the Southern Pacific in 1965. Joe nudged me to want to model an earlier time. My first idea was to model the old Pacific Coast Railway, if it survived WWII, was bought by the Southern Pacific and converted to Standard Gauge. It felt like the right move, but off of the mark. Arnold then released a model of an SW1, and the Pacific Electric loved to lease them from it’s parent. From what I can tell, only 1011 was lettered for the PE, and that was enough of a push to pull the timeline of my switching layout and changing the location. I am now modeling a fictitious branch of the Pacific Electric, to the beach city of Playa Desnuda. I liked the look and feel of the Santa Monica Airline, but I could only find a handful pictures and no track maps. The west half of the layout has a freight station, D’Amato Lumber (based off of Fisher Lumber) and Gallifrey Supplies, it’s bigger on the inside. The east half is currently has an oil depot and a bar, and is waiting on a strip of stores. The oil depot is going to be scratch built and I am thinking of using DPM kits for the local businesses. Like the real Santa Monica Airline, I decided to model the Playa Desnuda Branch in 1953, after the end of passenger service and the line poles came down….for now. If a Baldwin freight motor or a Hollywood Car came available, the poles will go back up…. Well, I got a Hollywood Car….